Alison Pearce is a young soprano whose reputation is now firmly established in the United Kingdom as a concert and oratorio singer and recitalist. She has an extensive repertoire and has received world wide recognition for her recordings of Celtic music. Born in Bath, she studied at the Guildhall School of Music and Drama in London, where she gained an Associate Diploma with distinction in performance. She then studied with Pierre Bernac in Paris and more recently with Gerhard Husch in Munich. In 1977 she won the Arts Council of Creat Britain Miriam Licette Scholarship and a distinguished second place in the Kathleen Ferrier Memorial Competition. 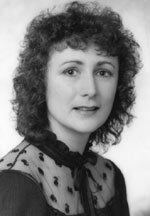 Her many awards and distinctions include first prize in the Grimsby International Competitions for Singers 1980, and the top soprano award among 53 entries at the 1983 s-Hertogenbosch International Singing Competition in the Netherlands. In addition to her many appearances overseas, Alison Pearce has in recent years become a regular and favourite artist at the Three Choir Festival where she has sung in such works as the Elgar oratorios and the Verdi Requiem. She sang in the first performance of the reconstructed Mussorgsky Mass with Worcester Cathedral Choir and the Royal Liverpool Philharmonie under Donald Hunt, and in Mahler's Eighth Symphony with the RLPO under Libor Pesek.